The genuine issue during the Elian Gonzalez circus had NOTHING to do with “parental rights,” as the Castro/Fake News Media/ Democrat propaganda campaign claimed (and many half-wits swallowed.) Instead it was: should a mass-murdering, terror-sponsoring foreign dictator trample on the U.S. Constitution and Bill of Rights with the compliance of a U.S. president. Well, a Clinton was in the White House. 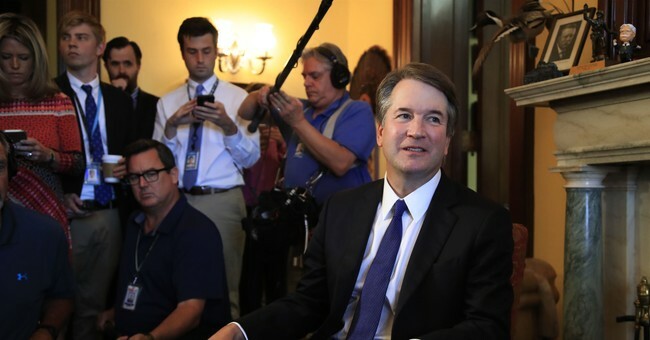 So naturally, despite the best efforts of people like Brett Kavanaugh, the communist dictator whose lifelong dream was to nuke the U.S., whose own “courts” channeled Stalin’s during the Great Terror, and whose sidekick Che Guevara boasted that “judicial procedures are an archaic bourgeois detail” –the whims of this mass-murdering international terrorist and criminal easily prevailed over the U.S. Constitution. In fact, this key item was frantically hushed by the Fake News Media/Democrat cabal, but Elian’s father was initially delighted that his motherless son was in the U.S. and in the loving arms of his uncles and cousins. Mauricio Vicent, a reporter for Madrid newspaper El Pais, wrote that a week after Elian’s rescue at sea, he’d visited Elian’s hometown of Cardenas in Cuba and talked with Elian’s father, Juan Miguel, along with other family members and friends. All confirmed that Juan Miguel had always longed for his son Elian to flee to the United States. Shortly after Elian’s rescue, his father had even applied for a U.S. visa! Then Fidel Castro stepped into the picture. “I always said I would turn over Elian to his father,” explained Elian’s Miami uncle Lazaro, “if Juan Miguel would come here freely and claim him. But I knew he could never do that. I knew it wasn’t Juan Miguel requesting Elian--it was Fidel." On the April 6th 2000 edition of the historic Fake News vehicle "60 Minutes", America saw a bewildered and “heartsick” Juan Miguel Gonzalez “pleading” to be allowed to have his motherless son accompany him back to Cuba, his cherished homeland. Fake News pioneer Dan Rather (who hailed Fidel Castro as “Cuba’s Elvis!”) was the one interviewing Elian’s “bereaved” father. "Did you cry?" the pained and frowning Dan Rather asked the "bereaved" father during the 60 Minutes drama. "A father never runs out of tears," Juan (actually, as we’ll see, the voice of Juan's drama school-trained translator) sniffled back to Dan. And the "60 Minutes" prime-time audience could hardly contain their own sniffles. Here's what America didn't see: "Juan Miguel Gonzalez was surrounded by Castro security agents the entire time he was in the studio with Rather." This is an eye-witness account from Pedro Porro, who served as Dan Rather's translator during the famous "60 Minutes" interview. Dan Rather would ask the question in English into Porro's earpiece whereupon Porro would translate it into Spanish for Elian's heavily-guarded father. "Juan Miguel was never completely alone," says Pedro Porro. "He never smiled. His eyes kept shifting back and forth. It was obvious to me that he was under heavy coercion. He was always surrounded by Cuban security agents. When these agents left him alone for a few seconds, attorney (and Clinton-chum) Gregory Craig would hover over Juan Miguel. "The questions Dan Rather was asking Elian's father during that 60 Minutes interview were being handed to him by attorney (and Clinton-chum) Gregory Craig," continues Pedro Porro. "It was obvious that Craig and Rather where on very friendly terms. They were joshing and bantering back and forth, as Juan Miguel sat there petrified. Craig was stage managing the whole thing - almost like a movie director." "At one point Craig stopped the taping almost like a movie director yelling, 'Cut!'" Porro recalls. Upon accepting the case at Clinton’s behest, Gregory Craig had flown to Cuba for a meeting with Fidel Castro himself. Craig's remuneration, we learned shortly after his return, came from a "voluntary fund" set up by the United Methodist Board of Church and Society. The same type of journalists and pundits who routinely erupt with snide snorts midway through any statement by Sarah Huckabee Sanders reported this item with a straight face. A week later Janet Reno’s INS maced, kicked, stomped, gun-butted and tear-gassed their way into Lazaro Gonzalez's small Miami home, wrenched a bawling 6-year-old child from his family at machine-gun point, and bundled him off to Stalinist Cuba. They left 102 people injured, some seriously. Many of the injured were elderly ladies who had brandished dangerous weapons. These weapons were rosaries. Interesting postscript: (Pedro Porro’s blockbuster revelations were featured in Human Events, The Drudge Report, and the Rush Limbaugh Show upon the release of the book, Fidel: Hollywood’s Favorite Tyrant. AIM (Accuracy in Media) forwarded them to Gregory Craig, who denied them. AIM then set up an interview/debate with this writer and Craig. Alas, Craig was a no-show. He sent a message basically accusing me of lying—but was apparently afraid to confront me face-to-face to make the accusation, especially while I presented proof to the contrary from an eye-witness.